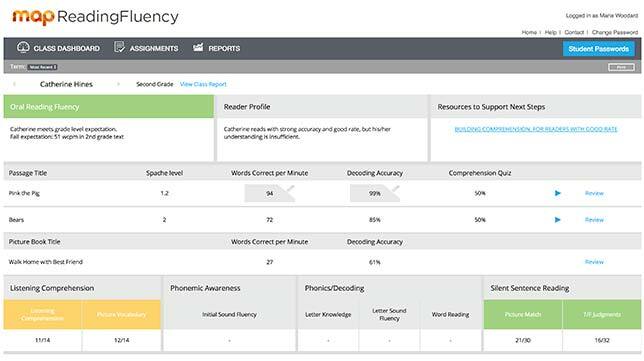 Non-profit NWEA is launching a new oral reading fluency assessment for K-3 that uses speech recognition, automatic scoring and computer adaptive technology rather than human judgment and individual administration. MAP Reading Fluency is an online program that promises 20-minute assessment of oral reading fluency, comprehension and foundational reading skills for an entire classroom of students. NWEA, which also produces MAP Growth and MAP Skills, develops assessment solutions for pre-K-12, delivers professional development and does research on assessment validity and data interpretation. The new online service was developed with technology from LanguaMetrics, which produces speech-enabled education applications. In turn, LanguaMetrics used EduSpeak, speech recognition and scoring technology from SRI International. EduSpeak is designed to examine reader behaviors, such as word and line skips, substitutions, and long pauses. Each student using MAP Reading Fluency starts by reading a short picture book and doing some timed, silent reading activities while wearing a headset and microphone. From there, the program, which is adaptive and adjusts to the skill level of the individual student, offers either three passages to read or a series of questions to assess decoding and language comprehension. Passages are recorded, saved and scored by speech scoring technology. Results are viewed on a teacher dashboard, along with reader profiles and links to resources for supporting next steps. Educators may choose to use results for differentiated and group instruction, guided interventions, or in screening for response to intervention (RTI). Because an individual student's work is recorded, teachers can drill down to analyze specific reader challenges or share his or her recordings with parents in the form of a "yearbook," demonstrating reading progress. The company said the assessments may be given up to three times a year and administered with a laptop, desktop or iPad. "Traditional oral reading assessment is based on a time-consuming, 30-year-old method which frustrates teachers and disrupts learning time," said Jennifer Knestrick, the NWEA product manager in charge of developing MAP Reading Fluency, in a press statement. "We're delivering a better approach; one that is fun and engages kids, adapts to the needs of every child, and is quick, giving teachers back valuable instructional time." "Teachers want to tailor their reading instruction to students' different needs, and good assessment facilitates that," added Cindy Jiban, the senior curriculum specialist for the program. "MAP Reading Fluency reveals those students who sound like fluent readers, but still struggle with comprehension." The program has already been tried out in 100-plus schools as part of an early adopter program. At Gardner Academy in San Jose, CA, which offers a bilingual immersion program, Principal Daisy Rojas, said she believes the software is "huge in terms of giving teachers valuable and important data in a short amount of time."